Today I'm sharing lots of activities that you can do with play dough and a toddler! Make your own! There are recipes everywhere, but I've had a lot of success with this recipe for Four Minute Play Dough from The Imagination Tree. Elsewhere on the site there are also many more recipes for themed play dough in different colours, scents and so on, there are so many! Collect a range of tools to use with your play dough to create different textures and patterns. 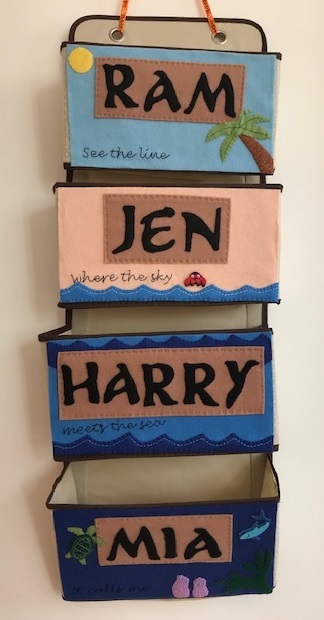 They can be purpose made tools or else bits and pieces from around the house, for example a garlic press, plastic knife from the toy kitchen, little bowls and plates, plastic cookie cutters and so on. Dried spaghetti can be used with play dough to add lots of interest. Use it to make a hedgehog, to make models and for fine motor activities such as threading Cheerios onto the spaghetti. Add a generous handful of glitter to the play dough for some fun sparkles. Although obviously once a batch of play dough is glitterified there is no going back! Make the dough into snakes and practice cutting with child safe scissors as a good first introduction to scissor skills. Decorate your creations with small objects from around the home, for example dried beans, paperclips, dried pasta, buttons, curtain hooks, coins, keys, pieces of pipe cleaner. They are easily removed from the play dough when you come to put it away and can be stored separately in a small container. Create templates on paper or card with the outlines of numbers and letters. Use play dough snakes to fill out the shapes. You could laminate these for repeated use. Older children can try without templates. Sculpt amazing landscapes like these at Filth Wizardry - train set and dinosaur island. You can use play dough alongside many other toys, like Duplo, Playmobil, dolls, or toy cars and trains for example. You can also use it to make quick props for other imaginative play, for example we make a simple Button Moon and Mr Spoon's spaceship. Collect leaves and other natural objects from the garden and press them into the play dough to create patterns. Extruders are brilliant for playing with play dough. I can't think of any easy way to make them yourself but there are many different types available to purchase like this one - Play-Doh Fun Factory (affiliate link). You push the play dough into a hole and then press down on a handle to force the play dough out in different shapes. We also reviewed this fab Play Doh Ice Cream Factory. Great post and lovely pics! I haven't been brave enough to make my own playdough yet - maybe I should give it a whirl! 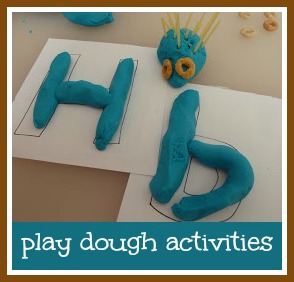 Here is another blog http://www.handsonaswegrow.com/2011/09/pretend-create-learn-with-play-dough.html with loads more ideas for things to do with play dough! Can you use the sort of playdough or salt dough that you bake in the oven, and use it to make playfood? When baked it can be painted (another activity!). Or just make animals like teddy bears and then paint them.